Please do have a look for the recipt and make sure you look after it , as it could prove VERY helpful to early COX owners. Being a Glide-ist, dust know Rob Lockett? Right, discussed at length with my Father over the weekend. 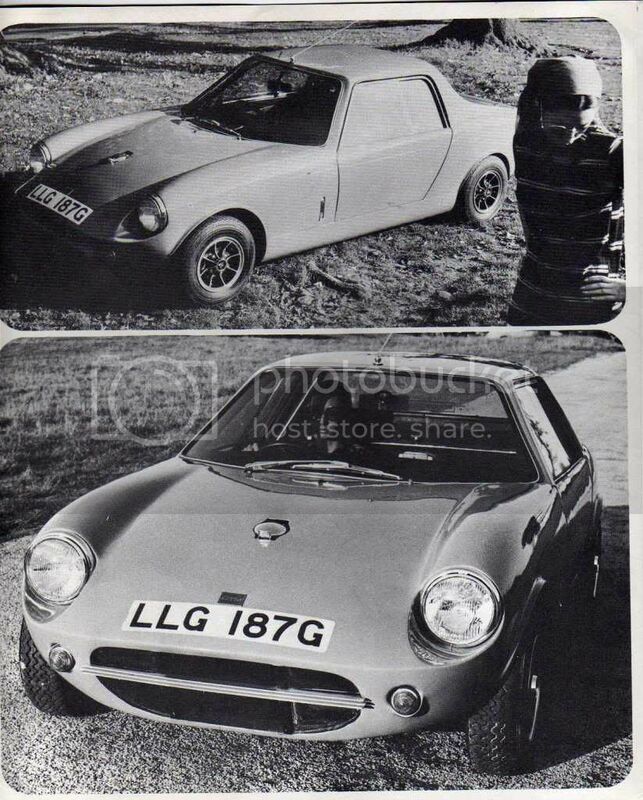 He believes chassis cox gtm 1/20 was bought in 1967 by an Malcom Perry, and was built and completed over the winter as it was first registered in March 1968 as a "Rebuilt Vehicle"
My common thought that it was built in 1967 comes from the MOT certificates as they state year of manufacturer being 1967. 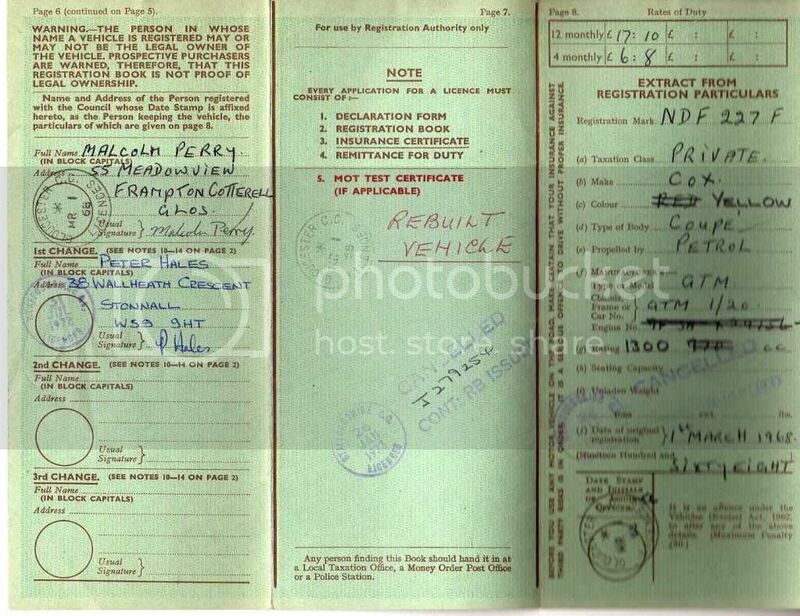 This MOT cert was just after it completed its 100,000th mile. My Dad thinks he bought it from Malcom in 1970. 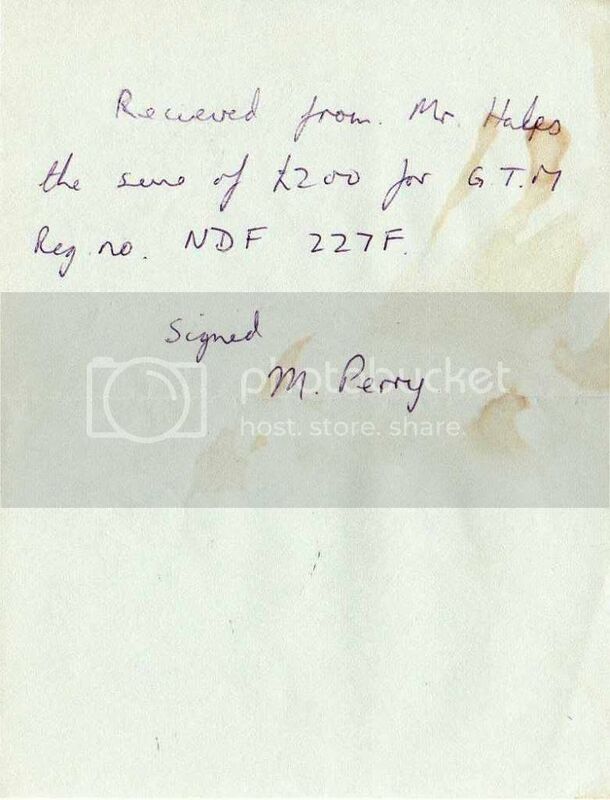 There is no date on the receipt for £200, but he has brochures and info from that era when he was investigating buying one. The car was apparently that bad that he took it apart and started again completing it in July 72. 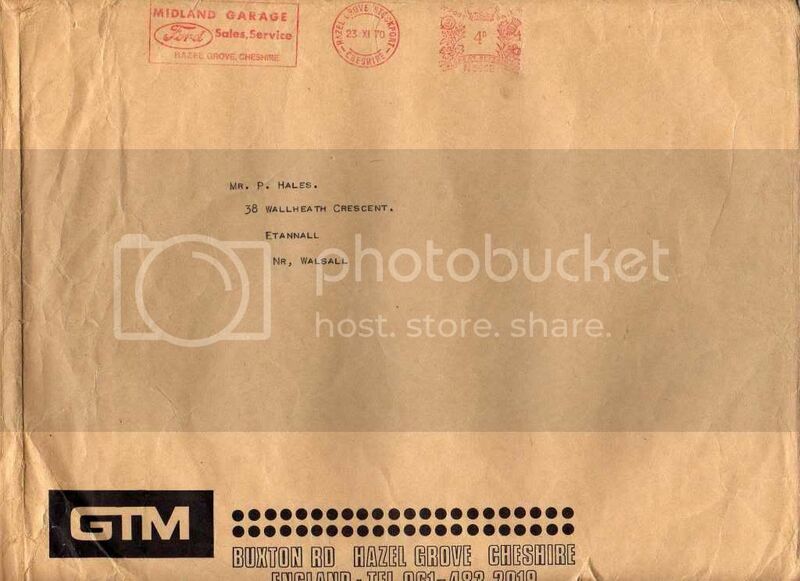 About the only other document was a response from Lundberg and Company, who took on building GTM's after Howard Heery had to move production because his premises got knocked down for a new road complex. 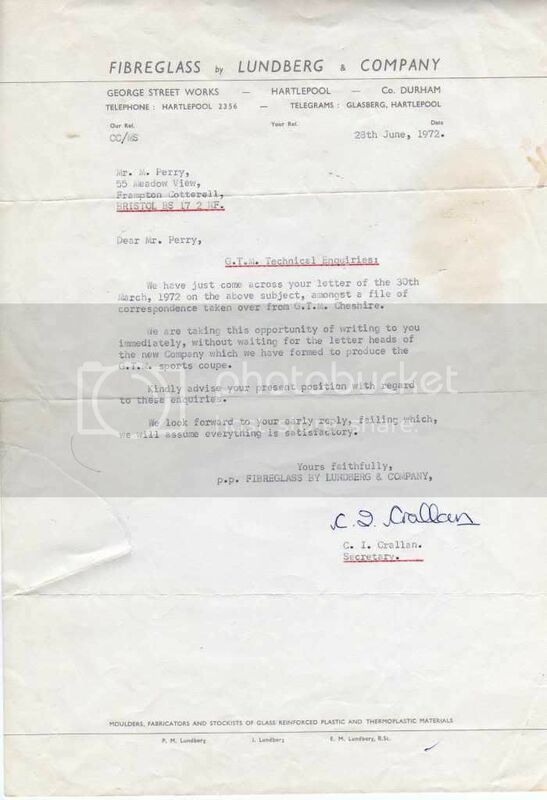 The only thing about this letter is that the dates or enquiry make little sense. Hope this enlightens a bit more? Who has the moulds and jigs now then? Any idea? My rebuild of continues. I found the chassis plate. I have chassis 38B dated Nov 1981. A few years older than I thought. Just grinding the gel off the doors which had suffered osmosis. I'll have to re-gel them with builders gel before flatting and painting. Registrations used to change in August each year so an F reg car could be anything from 1st. 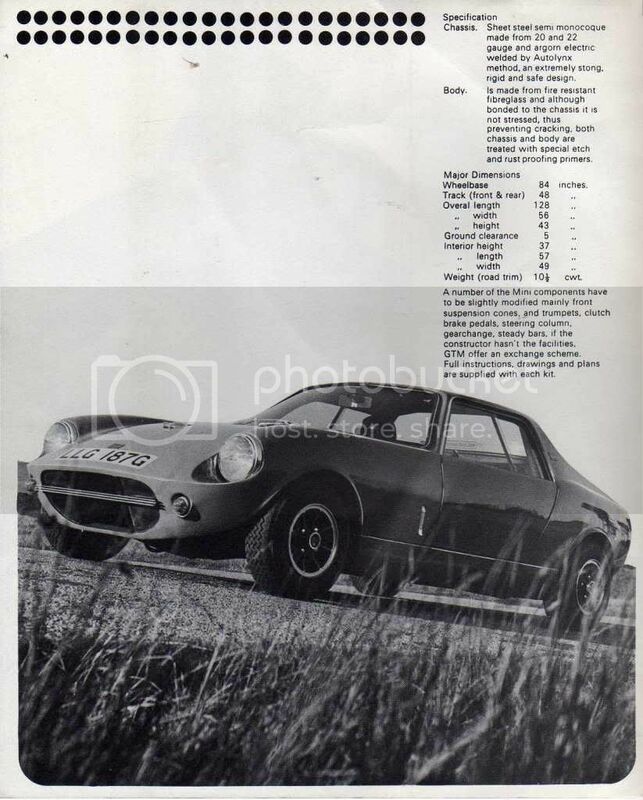 August 1967 up to 31st. July 1968. 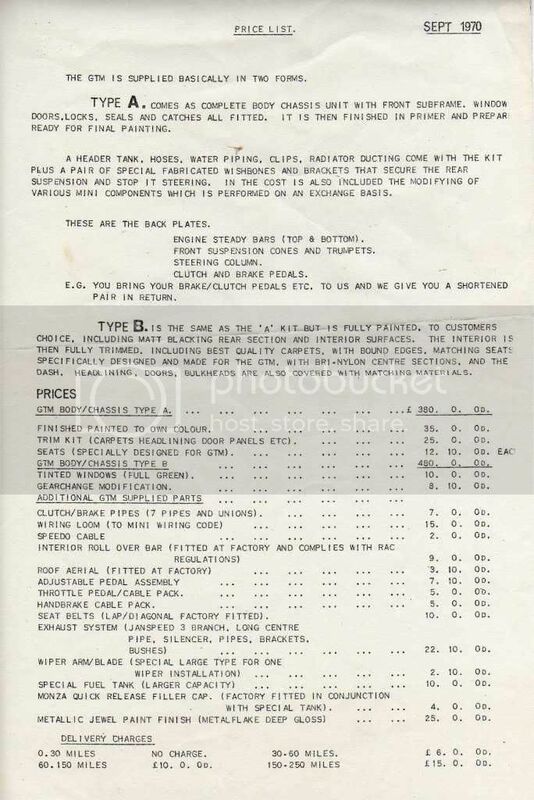 When I was into hot rods and customs back in the late 70's/ early 80's you could build a one off and get it registered as a new car and you didn't have to have everything new to do it, a fair few model T's had 1972 and 1973 registration numbers as that was when they were built. 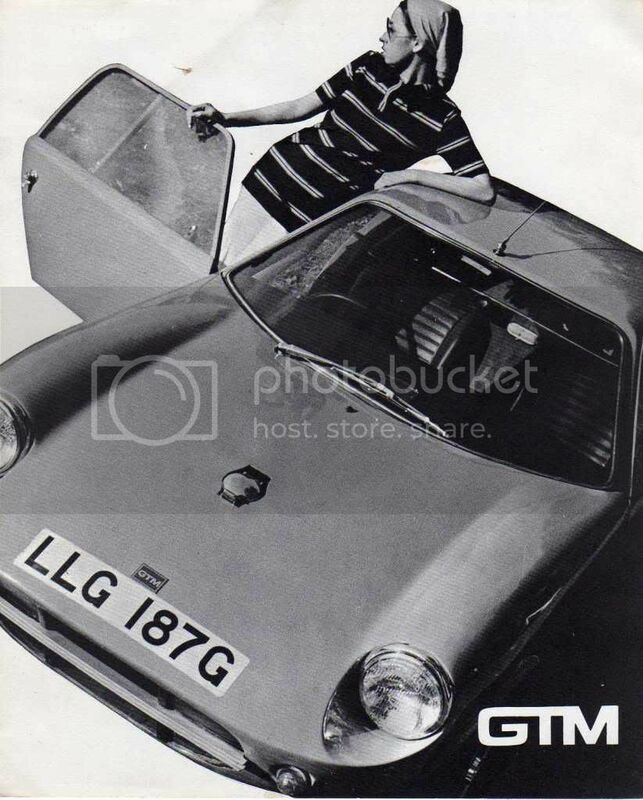 This is now becoming a bit of an issue for older kit cars as the goal post have changed and the DVLA are retrospectively going over certain kits and removing the registration numbers and giving them Q plates, unless you can prove where the components came from or that it had been done many moons ago. 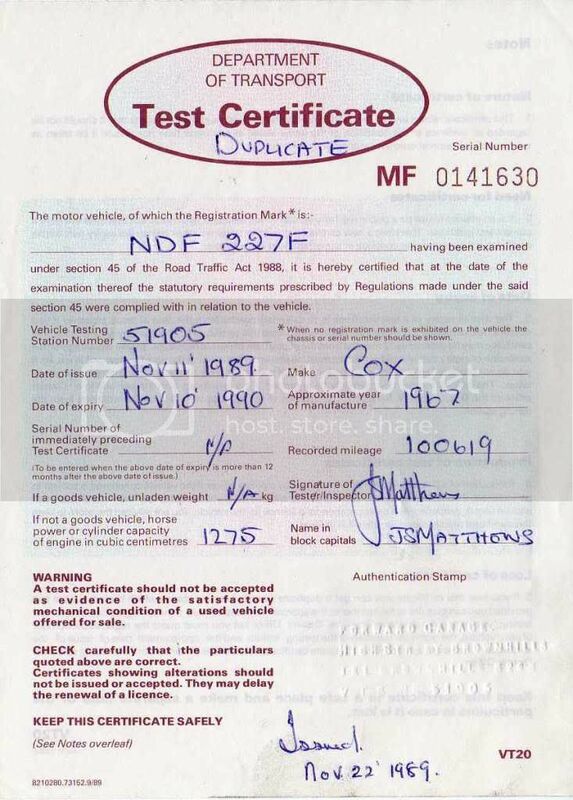 I know of three kit car owners that have been asked to take their cars to be inspected by the DVLA to verify what they are, there is no charge at the moment for this check but if they don't agree then you will get your historic reg taken away along with the free road tax as well. DONT panic though because these cars have been "pulled" because the police or the MOT station has not recognised what the vehicle is, for example if your car gets spotted and the police check the registration and it comes up with Jaguar, they know that it isn't a Jaguar and so report it to the DVLA who then get in touch with you to ask the questions and do an inspection. If your V5c states a make and model that the police don't know about or have never heard of, so long as they are satisfied that it is what is on the log book no further problems. I have been asked to produce my V5c for my daily American driver, this after running it for 6 years and the car having been imported by the original owner just one year after manufacture. The reason is that it is a Chevrolet Suburban on my insurance documents but the V5c states GMC Estate and no engine number, everything was sent off and all is well so I was happy. 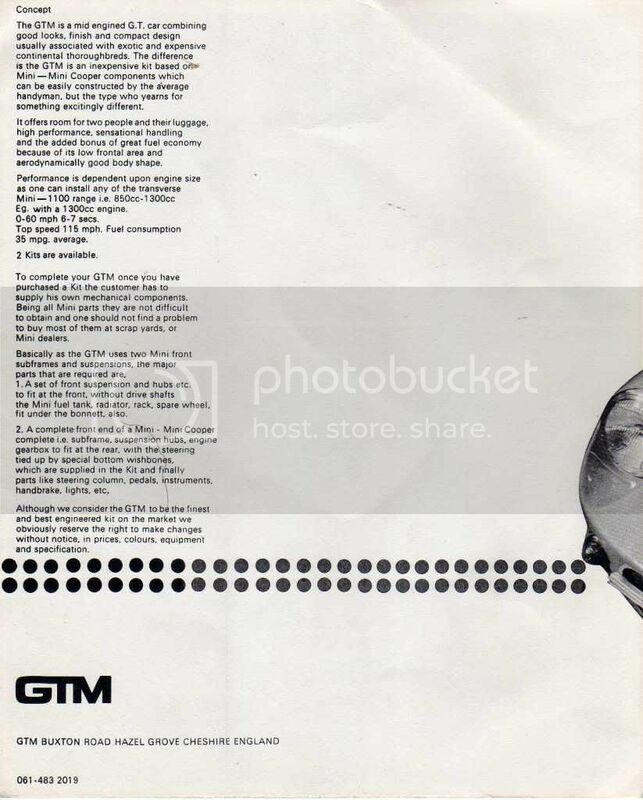 May I save the Heerey GTM leaflet on my computer? Very kind of you to ask, most people wouldn't have bothered I think. I've probably broke some weird law in posting it so I don't have a problem with anyone else saving it. I'll be amazed if anyone out there gets upset. hi all i have done something very sinfully and am in desperate need of help i got a coupe 4years ago and started work striping it down and ripping out the rot problem is i scraped the tub! at the time i didnt realise that it is one of the first made untill ive seen the pics on this tread and my shell is identical to the yellow one and the one on the leaflet!! now im very depressed as im shore you all will be. I can get another batch of the heated screens if we have enough interest, I've sent you an email.